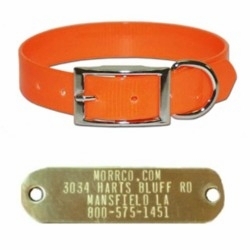 This 3/4 inch wide soil and water repellent SunGlo dog collar comes with a riveted on brass name plate attached to the collar. 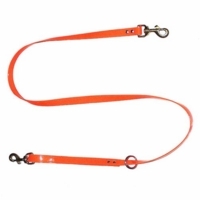 This dog collar is made out of high visibility polyurethane coated nylon that resists rotting. The sunglo material be cut off and have holes added without burning or melting. Our collar comes in sizes 16,18 and 20 and in colors Blue, Green, Orange, Pink, Red, Yellow and Purple. For correct collar size you must measure your dog's neck. 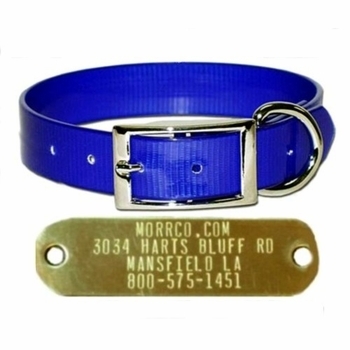 There is no refund or exchange on dog collars with name plates attached. Size 16 will fit a 9-1/2 to 12 inch neck. Size 18 will fit a 10-1/2 to 14 inch neck. Size 20 will fit a 12-1/2 to 16 inch neck. We can stamp 4 lines with 21 spaces on line 1 and 4 and 19 spaces on line 2 and 3. Most dog owners usually put their name, city, state and phone number.. It takes a couple of days to get the name plates printed for this collar.